Many coin collectors are attracted to the hobby of coin collecting by the portraits which appear on coins, usually of the kings and queens of England, which go back to Edward VII on Australian coins and before that (in recognisable form) to the Tudor monarchs. When the collector discovers Roman coins he/she finds a vast array of portraits of emperors, empresses and other notables. More images depict ancestors, gods and goddess, and rulers from the distant past. These portraits and images are of great interest to teachers, scholars and students of history and art and the subject of continuing research. For collectors they present a popular starting point for collections of ancient coins. A collection of portraits provides an atlas of Roman history over several centuries and is a fascinating way to put this vast civilisation in perspective. From the outset, however, the sheer numbers of portraits in the Roman series forces the collector to make decisions such as whether to cover the field or specialise in a particular area, whether to stick to a particular denomination and what quality to aim for. Roman portrait coins span hundreds of years and offer many possible collection themes and specialisations. Figure 1. Evolving portraits of Faustina the Younger as taken from Roman denarii. The portraits are in chronological order, left to right, from ca AD 148 to the late AD 160's. Another important question is whether there is just one portrait type for a particular historical personage or several. Roman portraits of Tiberius, for example, changed very little over a long reign; there are several portraits of Nero from boy to man and a great many of Faustina the Younger (Figure 1) over a thirty year period. One of the objectives of this series of articles is to provide examples and illustrate the portraiture of emperors and empresses particularly when there is an evolving sequence of portraits. Before expanding on a little on these historical groups or collection themes (most of which will be the subject of later articles) it is worth thinking about what the word portrait means today and what were the equivalents in the ancient world. The Concise Oxford Dictionary defines portraits in terms of 'likeness' that is close physical resemblance. The word 'portrait', however, has no direct equivalent in either Greek or Latin. The equivalent Greek word eikon (eikwn) and Latin word imago correspond more closely to the English word 'image' than to 'portrait'. The important point is that an image is identified with the subject and conveys something about the subject. Sometimes this is a physical likeness; sometimes the idea, status or character of the person. Very large numbers of images of persons were produced in the ancient world, first as sculptures and later on coins. Some of the coin portraits are thought to be true portraits (likenesses) while others are clearly idealised or stylised images. The portraits that appear on Roman coins, from the late Republican period, are the result of a mixing of two approaches to image making, the Greek and the Roman. The Greek sculptor Polykleitos (see Walker p. 39) in the fifth century BC, was influential in developing the idea of the ideal human form, representing the physically beautiful and morally good. This lead to a portrait style that tended to suppress individual features and emphasise physical perfection. Images in sculpture of many famous Greeks, artists and thinkers of the classical period, reflected this tradition. Romans avidly collected such portraits, and copies of them, as emblems of a much admired culture. Ruler portraits were more common in the later Hellenistic period and Alexander the Great is said to have played an influential role in their development. Alexander is said to have been aware of the need to project a good image and to have appointed artists he considered were able to portray his character as he wished. It is not clear whether the images of Zeus and Heracles on the tetradrachms respectively of Philip II and Alexander the Great, are idealised portraits of those rulers. 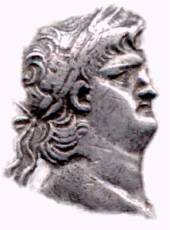 Following the break-up of Alexander's empire late in the third century BC, however, clearly attributed coin portraits appeared - first of the Ptolemies and then of the monarchs of other Hellenistic kingdoms. Coins were used to pay armies and it helped for soldiers to know who was in charge. These coins, idealised to a considerable extent, served as a model for Roman portrait coinage. Another influence on Roman portraiture was the Roman practice of keeping images of deceased members of notable families. As described by Polybius (see Walker p. 76) the images were masks reproducing with remarkable fidelity the features and complexion of the deceased. Pliny the Elder noted that portraits were displayed for admiration … wax models of faces …the entire company of that house that had ever formed a art of it was present . This practice, which represented the subjects realistically and showed all blemishes, is thought to have lead to a style of portraiture known as late Republican verism, which portrays the actual features of the subject. Figure 2. The portrait on the left is a Hellenistic portrait of Antiochus VIII from a Seleucid tetradrachm. The portrait on the right is a veristic Republican portrait, from a denarius of Antius Restio issued some twenty years after his death. The Hellenistic Portrait was the ideal reconstruction of a personality, in which accidental facts of nature were indeed accepted and used, though only as the starting point for an imaginative exercise in concretised psychology. The Roman portraitist, on the other hand, approached his sitter objectively not subjectively; he looked from the outside at the features one by one and transliterated them piecemeal into the language of art….The Roman portrait was the exact statement of a particular case; it was as far removed as possible from the generalised and the typical. The Romans, who very often used Greek artists and artisans, used both approaches in coin portraiture, with the emphasis moving from one to the other in different periods. Thus idealised portraits of Augustus and the other Julio-Claudian emperors followed the veristic portraiture of the late Republic until some of the later portrait of Nero brought a return to realism. This continued into the early second century AD when portraits again tended towards the Hellenistic. In the mid to late third century AD a trend towards a stylised simplicity began, and this continued, progressively through the late Roman and Byzantine eras. With few exceptions, 'portraits' on the coins of medieval Europe continued this trend; they are simple images which are only intended to be recognisable as faces. 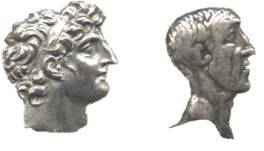 In the later Republican times a number of coins with retrospective and/ or imaginary images of persons long dead, such as Philip V of Macedon, and real and imaginary heroes and kings, such as Ancus Marcius appeared (Figure 3). Some of these may have been based on real images such as funeral masks or, in the case of Philip V, a contemporary (Macedonian) coin or sculpture. Figure 3. Imaginary portrait of Ancus Marcius, the fourth king of Rome, taken from a Republican denarius issued BC 56. The imaginary and ancestor portrait coins of the Roman Republic form an interesting collection theme and will be discussed in more detail in a later article. The imaginary images of previous decades were followed, in the late Republic, by the first true portrait coins. This group includes portraits of the imperators and other notables such as Julius Caesar, Mark Antony (Figure 4), Pompey and a number of other bearers of high office. It is a highly desirable area for collectors, unfortunately very expensive, which is the subject of a recent book by David Sear, The History and Coinage of the Roman Imperators 49-27 BC . Figure 4. Mark Antony, from a denarius issued BC 39. The vast imperial series followed the rise of Augustus and by far the greater part of this coinage has a portrait on the obverse. The first era of imperial coinage is sometimes known as the period of the 'Twelve Caesars of Suetonius', after the Roman historian Gaius Suetonius Tranquilllus. The 'Twelve Caesars of Suetonius' takes in the Julio Claudian and Flavian dynasties and comprises Julius Caesar (who really belong in the group above), Augustus, Tiberius, Gaius (Caligula), Claudius, Nero (Figure 5), Galba, Otho, Vitellius, Vespasian, Titus and Domitian. The Twelve Caesars is the most highly sought after portrait series in the ancient world; good coins of many of these emperors are scarce, however, and the set is costly to acquire in any metal. Figure 5. 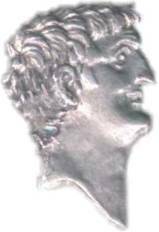 Nero from a denarius issued in AD 65. The 'Later Caesars', covers a period from the beginning of the reign of Nerva in AD 96 to the death of Severus Alexander in AD 235, and includes the important and interesting emperors Trajan, Hadrian (Figure 6), Antoninus Pius, Marcus Aurelius, Septimus Severus and Caracalla. With the exception of a few rarities this is a very affordable series of portraits, particularly in silver, and there are many examples of high quality engraving. Figure 6. Hadrian from a denarius issued ca AD 137. The 'Age of Military Anarchy' starts with Maximinus I in AD 235 and ends with Carinus in AD 285. Many but not all of the 23 Roman and secessionist emperors were soldiers and a number of these were non Roman with humble origins and this is reflected in the severe military style, and increasing simplicity, of many of the images. With a few exceptions, the coins of the main emperors of this period are among the least expensive of the entire Roman series especially in higher grades. Figure 7. Maximinus from a denarius issued AD 236-237. This period witnessed the rise of Christianity and the decline of Rome. Identifiable portraits, however, had practically ceased to exist. This was no doubt deliberate because from the late third through to the fifth century there were periods of collective rule with two or more emperors ruling jointly, and a generalised image was often used. There were, nevertheless, changes in style with time, and historical periods can be readily identified. Constantine, for example, revived Augustan images. The coins of the late empire, particularly bronze, tend to be inexpensive and many images reflect the official recognition of Christianity. Figure 8. Theodosius II from a tremiss issued circa AD 430. Portraits of Roman notables form another interesting topic for the collector and student of history. The very existence of a portrait of Agrippa, of Germanicus or of Antinous (Roman provincial coin) provides a different perspective and often specific historical insight. Many of these coins are very scarce, elusive, and expensive. The issues of Greek cities in imperial times, variously known as the Greek Imperials or Roman Provincials, provide one source and it is well worth combing dealer's lists for such portrait coins. Figure 9. Germanicus from an as, issued as a commemorative by Caligula, ca AD 38. Portraits of women, wives, mothers and sisters appeared in the late Republic and continued throughout Roman imperial times. They present a fascinating theme for the collector. Female heads are generally quite scarce until the mid second century AD when it has been postulated (Hill p. 3) that Faustina the Younger, and possibly Sabina, had control or influence over the minting of coins in her name. The female portraits, as well as conveying likenesses, tell us something of fashions prevalent at the time. Hairstyles and adornments ranges from the severe to the very elaborate; many are elegant. Roman denarii and antoniniani from the mid second century AD on provide an excellent source of these portraits. Many earlier portraits can be found on provincial coins such as the tetradrachms of Alexandria. Figure 10 Agrippina the Elder, from a Syrian tetradrachm, AD 38. All portraits have been taken from actual coins in the author's collection or Romanorum stock. A Dictionary of Ancient Greek Coins, John Melville Jones, Seaby, 1986. A Dictionary of Ancient Roman Coins, John Melville Jones, Seaby, 1990. Ancient Portraiture, Virginia Museum, 1980. Carolingian Art, Roger Hinks, University of Michigan Press, 1962. Greek and Roman Portraits, Susan Walker, Trustees of the British Museum, 1995. Roman Historical Portraits, J M C Toynbee, Thames and Hudson, 1978. Suetonius - The Twelve Caesars, Robert Graves translation, Penguin, 1979. The Undated Coins of Rome, Philip Hill, Spink & Son, 1970. Article previously published in the Australasian Coin & Banknote (September 1999).